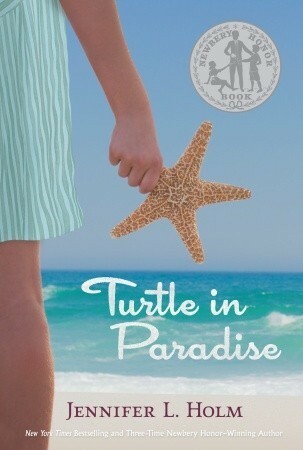 Turtle in Paradise is just the kind of book I love to read best. Sweet and clean, well-crafted, beautiful, with a host of characters I wish I knew, and an open-armed family at the end. It claimed Newbery honors last year. Turtle grew up in New Jersey with her single mother. She’s the steady one in the family. “I think the color of a person’s eyes says a lot about them. Mama has soft blue eyes, and all she sees is kittens and roses. My eyes are gray as soot, and I see things for what they are.” When Mama takes a job as a housekeeper for a rich family that will not allow children, Turtle travels to the Florida keys to the home of her aunt and uncle and a host of cousins. Seems everyone in town’s related to the Curry’s of Curry Lane. “Where’d you get that name of yours?” she’s asked. “Mama says I’ve got a hard shell,” she replies. And it’s true she’s made of stern stuff. She adapts quickly to a new way of life. She outwits the ice cream man, charming a scoop for free after her cousins fail. She’s not afraid to speak her mind or give advice to grown-ups, the “ones who need it most.” And when her cantankerous, bed-ridden grandmother swipes her dinner onto the floor–twice–Turtle doesn’t jump to get her more. Instead, she sets down and enjoys every bite of her own meal right where Grandma can watch her. But by the end, Turtle learns she’s no less a dreamer than her mother, and no less vulnerable. Thank goodness for family in hard situations. Jennifer Holm writes a lovely story. I highly recommend this book. I wondered what the turtle means in the title. It sounds like a sweet book. Ooh, good call. I think you’re right.